Kindergarten 1971. 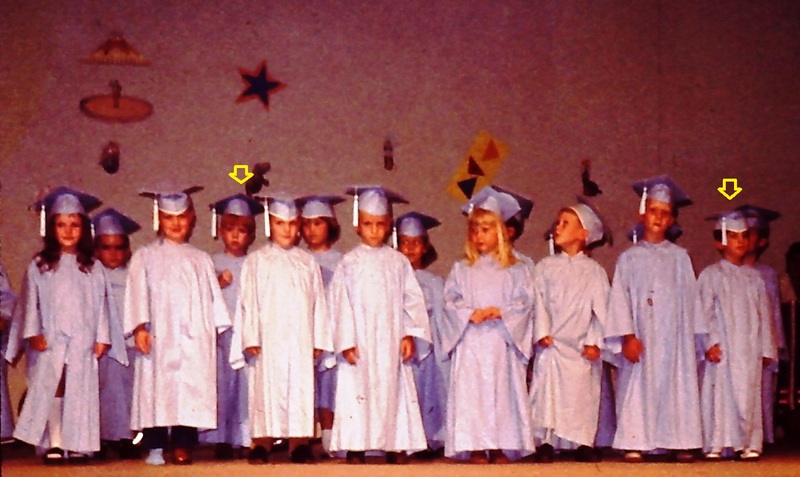 Keith is on the left (arrow over head) and I am on the right...just as our teacher intended! There are some moments in your life that you will never forget….the moment you got your driver’s license….a first date…the day you got married….the moment your first child is born….and the moment you meet someone who is a true friend and that sticks with you from then on. I remember each one of those events like they were yesterday….where I was, what I was doing, what the weather was like even. I remember it was a beautiful day outside, typical of a late summer/early fall day in Georgia when the transition from summer to fall is happening daily before your eyes. The grass was still green and the oaks were still full with leaves but here and there, a tiny splash of color would peak from among the sea of green, waiting for the first cool breezes to set them free and greet the new season. These were the kind of days that made you feel alive and the sun was bright and nourishing and warm outside. I had begun my first day of kindergarten for 4 year olds, now known as 4k and as I entered into this strange new world of teachers and rules and learning about things every 4 year old must know, I didn’t really know a single person there. I met Keith for the first time that day and he stood out among the rest of the kindergarten class with a head of hair the color of spun copper, a true redhead with the temperament to go along with it. He was boisterous, loud and would never back down from a challenge or a dare, laughed at everything and was the fastest kid in the entire class. He was as absolutely different from me as it was possible to be, yet somehow or another we became friends that day and kindergarten was more fun because of it. One day Keith and another, larger kid got into a scuffle on the playground over one of those pop-up books and the other kid shoved Keith. I yelled at the other kid to leave Keith alone and the kid knocked me down. Before I could get up, I heard an awful sound, the kind you hear when someone gets the wind completely knocked out of them….like a football player, headed for the touchdown, Keith had sprinted faster than lightning, head down, right into the other boy’s stomach and knocked him down so hard that the kid couldn’t get his breath for five minutes. That’s the kind of friend Keith was….his loyalty was unquestioned, unwavering and absolutely, utterly dependable. After that year, Keith went to public school and I went to private school and I didn’t see much of him but not long after that, my parents built a new house and we moved into it. The first night in the new house there came up such a storm that one thought Noah and the Ark might come floating by any minute. The next day I was out exploring my new home and its surroundings, noticing how the water had pushed a lot of twigs and branches into a pile from the hard rain when Keith came riding up on his Big Wheel and asked me what I was doing there. I proudly pointed to my new house and told him we had moved in yesterday. I asked him what he was doing there and he pointed to the house next door and said “that’s where I live”. I could hardly believe my luck-another kid, my own age, that I was already friends with, living right next door to me! In my old neighborhood, on the other side of town, the next closest person in age to me was my mother so things were already looking up for me, having a friend to play with. When Keith and I had first met, we were both the only child in our family but since then, each of us had gained a brother and like us, they were only one month apart in age. The four of us, plus two more that lived across the street became a pretty close knot and there were other children in the neighborhood as well. For a year, Keith and I were next door neighbors, our houses sitting on either side of a narrow but deep vacant lot until a new house went up there and a young couple moved in. I bet in hindsight, if he had known that his front yard would be a highway from one house to the other over the next several years, Mr. B might have decided to rethink his decision to build there. They soon added a new baby to the mix who became the youngest of our group and over many years, we all played, grew and thrived. Keith and I, only a month apart in age, were the oldest and the leaders of the group. We would ride our bikes all over the block with the younger kids in tow. Keith loved sports from the moment he saw a football and many afternoons were spent in his big backyard as we drew sides, picked teams and tried to beat Keith’s side. No move was too aggressive, too daring or too dangerous for Keith to try and he tried them all and somehow managed to survive them. We always were able to find some way to have fun and to get in trouble. Once, it poured rain for hours and we had the bright idea to build a dam in the drainage ditch from a pile of bricks left over from the building of my parent’s house. Down in the ditch we went, the smaller kids handing down bricks and Keith and I packing them together as the water rose higher. When the dam was finished, we had a nice lake backing up there but then it overflowed the banks and starting washing through my parent’s yard, carrying mud and dirt along with it. They weren’t happy about that. Another time, we decided to build a bike ramp out of left over plywood and bricks (parents-if you ever build a house, make sure you remove all the surplus building materials-your kids WILL put it to use, trust me). After a few jumps in the air, Keith (who was a big fan of Evel Knievel) had a brilliant idea and moved the ramp to the end of his driveway which had at one time ended in a full length, concrete block wall because of a two foot drop at the end. His dad had cut an opening in the block wall about three feet wide and had built steps down into the backyard so you didn’t have to go around the wall. With the added two feet of elevation, putting the bike ramp there seemed like a really good idea at the time because the ramp plus the drop would mean a three foot jump in the air. Keith went to the top of the driveway, turned around and pedaled as fast as he could down the sloping driveway, gaining momentum with each second. He had to be going 20 miles an hour when he hit the ramp and up it he went, sailing through the opening in the wall-and his left pedal struck the wall as he went through the opening, causing the bike to rotate in the air. The image in my head still makes me laugh as I picture Keith and his bike flying through the backyard, spinning like a helicopter with him somehow managing to hang on to it as it spun. It was a miracle he wasn’t killed. Evel Knievel would have been proud. When we turned 16, we both got cars, both relics from the previous decade and possessed of far more horsepower than two teenagers needed at their disposal. We got in a trouble a few times with our parents for racing them down some of the more rural county roads and a few city streets as well. It was a miracle we weren’t both killed on more than one occasion. During Keith’s senior year in high school, his family moved to a new house in another neighborhood but since we both drove, this made little difference given that it was a short ride between houses. His parents were my parents and mine were his and even though we still had few common interests, we managed to be best friends through those years. We both joined the volunteer fire department at 18, ready to save the world from imminent conflagration, got kicked off the fire department for getting in a fist fight (we did that on more than one occasion) and got reinstated later for good behavior. I made a career out of public safety and Keith went to work for the state but never gave up being a volunteer firefighter. When I moved away from home and got an apartment, Keith went too and our friendship somehow managed to survive that. In fact, it survived everything we ever threw at it. We got mad at each other, we fought each other, we argued and we bickered all the time but we never intentionally wronged each other and there never was a friend more faithful than Keith for almost thirty years. Wrong him, and he could hold a grudge for a very long time but if you were his friend, he would have walked through fire for you and he literally did this many times for people. We shared a lot of history over those years; school, growing up, church, going in different directions but always best friends. I always said of him that if you were stranded in Miami Florida, 500 miles from where I live, and you needed Keith to come get you, he would get in the car, no questions asked, and make the drive down to get you. He was just that kind of person. He moved out of the apartment after a year and a half but was still never far away and we would always keep in touch or go meet for pizza and beer at the local pizza eatery. I was dating and later got engaged to the woman who is now my wife and no one was happier for us than Keith was. He wrote a very personal note to us which I still have and which touched both of us deeply, displaying a depth of character that a lot of people didn’t realize he had….but one which I and those he chose to share it with knew very well. That he shared it with my wife was a sign that because she was important to me, she was now important to him as well. The pictures and videos of our wedding and the reception following it are the last ones I knew ever made of him….laughing and enjoying life, just as he always had. Very few material things were important to Keith….he didn’t care if his car had dents in it or if his wallet was light at the moment…as long as he had family and friends around him and the price of a Dr. Pepper in his pocket, he was happy. He loved his own family very much and though he was not a prideful person, he was very proud of the niece that made him an uncle. Over the course of many years, I watched Keith’s life unfold and was there through a lot of good times and a few bad times. There were things in his life that would have crushed a lesser spirit than the one God gave to him and one could never be down or depressed when Keith was around. He lived his life with a simple philosophy and that was to enjoy every minute of it and live life as a gift to be savored and not a possession to be locked away; laugh heartily, love others freely and treasure your friends. His life had purpose and meaning and that meaning was different to each individual who saw him. To me, he was my best friend and someone I could always count on. He had a big heart and he cared for people and did things for people when he knew they needed help. As big as his heart was though, it had a defect and one morning, eleven years ago today, he just didn’t wake up. Each of us deal with loss in a different way and dealing with his loss was the hardest thing I ever faced but I was moved at his funeral by the outpouring of people and staggered by the fact that he had so many friends and people who knew him, from all over, far more friends that I would ever have, and yet somehow he had decided I would be his best friend. Even though he has been gone these years now, he isn’t truly gone. He is kept alive in the hearts of his parents who loved him and miss him but who have found peace knowing where he is today. He is kept alive by a brother who makes sure that the niece who barely knew him and the nephew who came later and carries his name know the man their uncle Keith was….and I will keep him alive in my memory and pass those on to my son so that he will know what a great man his Daddy’s best friend was and the fun we had traveling the roads of life. This is a very nice tribute to Keith. I know how much you miss him. I wish I could have known him better. This brought me back a few years. I was one of the ones in the neighborhood that came along later. I found out he died on my one year anniversary weekend. This is my 12th. He is missed. Michael, what a wonderful tribute to Keith. He was as wide open in high school as you describe him in kindergarten. I loved that! I am glad you have taken the time to remember, and give more meaning, to an already meaningful life. Cheryl-thank you for your comments. I imagine you could write several volumes about all “your” kids over the years!